"... for better, for worse, for richer, for poorer, in sickness and health, to love and to cherish, till death do us part." The story of "Penny Serenade" radiates amiable normality. This is how life goes: happy and funny, sad and tragic, with lighthearted times and periods in which we get a lot more than we bargained for. Simply for a change it's nice that we are not with the rich folks, but with common people struggling financially. As much as I like the main part of this plot, I simply love how exemplary well filmed it is. What a gifted team and what a wonderful result! A bunch of laurels - or more appropriate a bay wreath - goes to director George Stevens and cinematographer Joseph Walker. 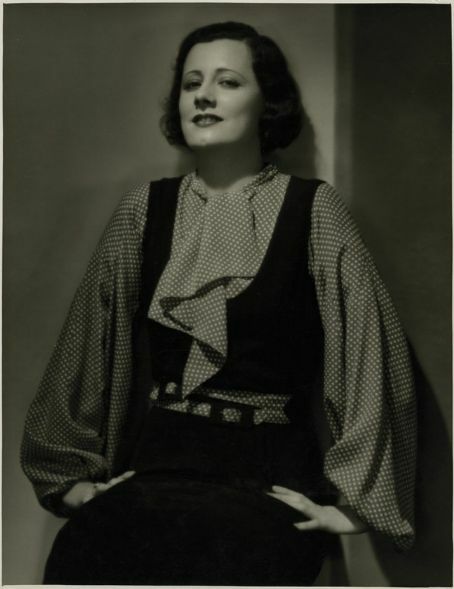 According to Irene, Stevens was a perfectionist who prepared meticulously each scene with his crew but did not need many takes. This precision and attention to details become apparent in the most interesting perspectives. 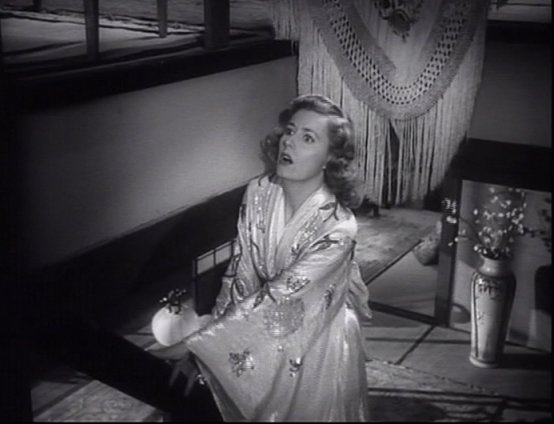 One example is the scene in the train. At first we don't follow the newlyweds into the compartment. The door is half-closed, and we are in the situation of an almost voyeuristic onlooker which gives this scene intimacy and eroticism. I slightly regret that we are allowed to enter the room now, but the whole mise-on-scène is a convincing proof why Old Hollywood didn't need nakedness to picture sexuality - of course allowed, marriage blessed post-code sexuality. For all of us who didn't get that they did not solely hold hands on the train, we learn in one of the next scenes that Julie is pregnant. Though our couple did not manage a honeymoon trip because of Roger's professional obligations they indeed succeeded in a partial wedding night - 100 miles long that is. the end of the "wedding record"
Another of my favorite scenes is of course the first night as parents - have a look at how the doors between the two rooms are used as props here - and I'd like to add the scenery when they prepare for the legal adoption assuming that they'll lose Trina. Stevens keeps us consequently at a distance utilizing an angle from the stairs which only shows moving legs. All are very busy packing Trina's things; we don't see their faces, but only moments later we are confronted with Irene's face in close-ups. She runs to the window, and while we can't see what's happening outside, her face tells the sad story of her daughter's departure. 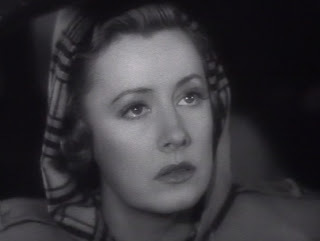 Did I ever tell you that I am very appreciative of Irene Dunne? This mixture of distance and nearness is utterly effective. 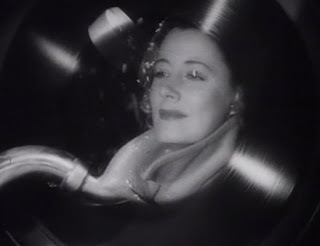 Moreover, cameraman Walker spoils us with a lot of beautifully photographed close-ups - which made selecting the screenshots for my Irene Dunne site a real difficult task. Did I ever tell you that I have a weakness for close-ups of Irene Dunne? 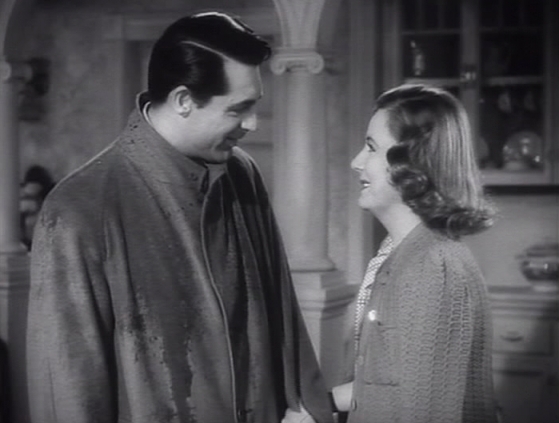 I already gushed a lot about Cary and Irene - or Irene and Cary - and I certainly could go on about their performances in "Penny Serenade." 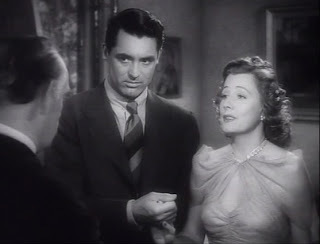 Grant's gained him his first Academy Award nomination, and the scene with the judge surely provides some of the most remarkable Cary Grant onscreen minutes. The guy really touched me, made me laugh, and convinced me completely in the whole rest of the story. Is there anything else I could expect from an actor? 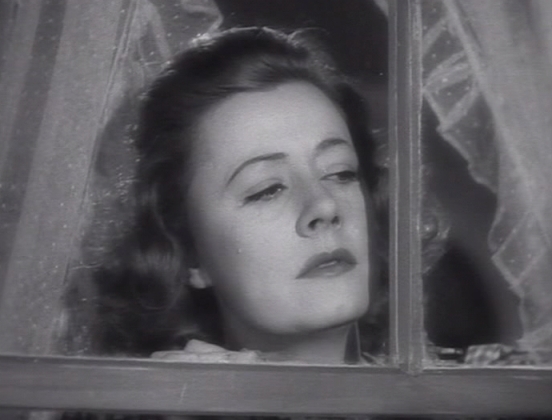 The idea of music as the golden threat for this story is not only a structure after my own heart, but gives Irene the opportunity to foreshadow each episode. These are the perfect moments for this fine-tuned actress with her expressive face. She and Cary Grant - both more on the restraint side of acting - avoid any maudlin. This story could have been a rich source of schmaltz but what "Penny Serenade" offers is beautiful sentiment. Edgar Buchanan has some great scenes as Applejack - the nicest of scene-stealer's -and Beulah Bondi as head of the adoption agency throws in another solid performance. Maybe they could have found a better child actress for "Trina, age six" (Eva Lee Kuney), someone with a more convincing smile would have been nice. This fake of a grin looks scary, little Eva! Up to this point I am really happy with this film, but here comes a personal difficulty. 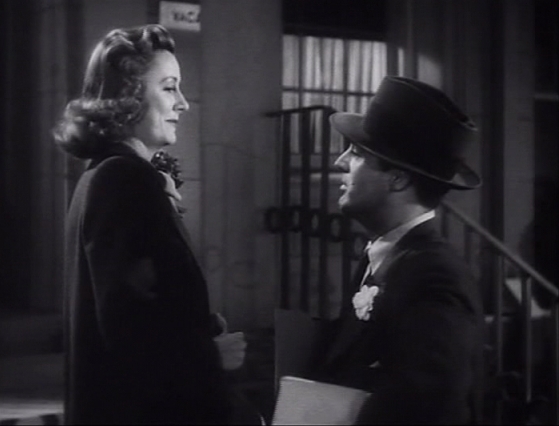 Normally, I don't watch the last minutes of "Penny Serenade" because I can't stand this phony Happy End. To "replace" one kid by another, and the assumption that this would "solve" all problems simply gives me the creeps. 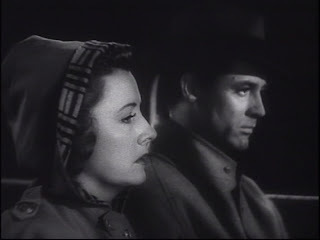 We just followed Julie and Roger for about two hours, learned that they were "meant for each other" (to stick to the songs), and when they start doing what they should have done a couple of days earlier - talk and share their loss and pain - the darn telephone rings and Miss Oliver (Beulah Bondi) offers a blond boy. Oh dear! I would have preferred a semi-open end; they start talking, descend the stairs, leaving us without any easy way out but with the awareness that they are once again on their way - together. Well, as long as all I need to get my personal version is the stop button, that can't be a real problem, right? Amazing review, Susanne. It made me smile a lot. 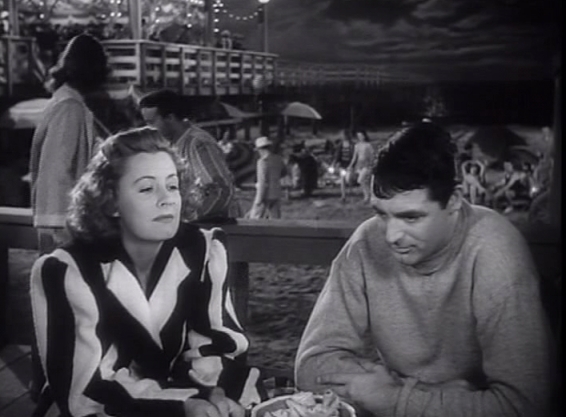 Penny Serenade was the first movie I've seen of Irene and I will be forever grateful to this film. I really appreciate your comments, especially about the ending. Thank you. Thanks dar! I wonder what you think abou the end? 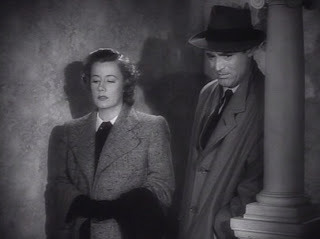 Penny Serenade is one of my favorite movies, and Dunne and Grant are excellent in their roles. 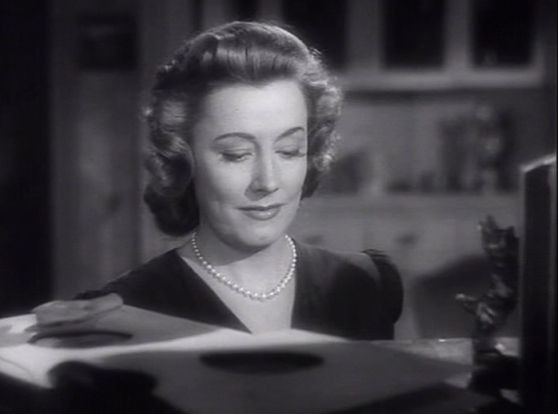 Irene was one of the most beautiful women, and it is nice to see that she was still getting starring roles into her 50's, as some stars from that era did not age as well as she did. 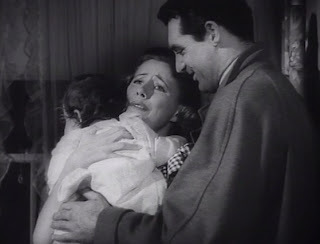 I just watched I Remember Mama last night, as I was so surprised to find that she was 50 in that movie, I thought she was at least 10 years younger. 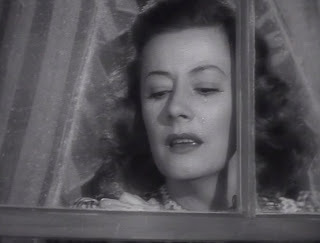 I have been fascinated with Old Hollywood since I was a kid, and Ms. Dunne has been one of my favorites since then, too. Your site is great, keep up the good work!! Thank you! 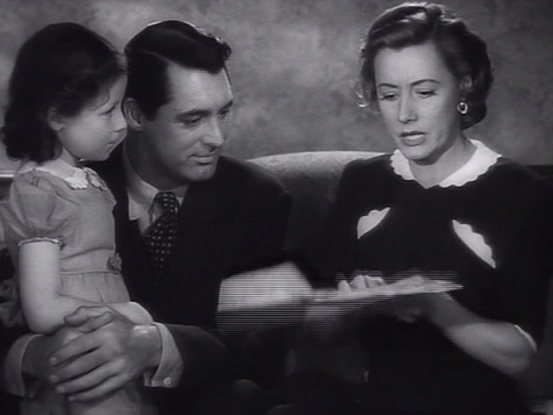 There are still a couple of films to come... Irene always looked about ten years younger than her actual age. Otherwise her career - as it turned out to be - probably wouldn't have been possible because she was already in her early thirties when she started in Hollywood. She looked like a "novice" but had the experience of a real pro. Quite a mixture! Hey Susanne, I watched this after work over the course of two nights...I absolutely loved it (I feel kind of embarrassed sometimes to think that I seem to have only two modes as far as movies are concerned-rampant enthusiasm or utter indifference)! Also very touching when he asked her to marry him before he transferred to Yokohama. "I promise I'll never take it off, whatever happens." Like you, I found the ending unsatisfying; your alternate ending would have done better. But on the other hand, maybe the point was that there's always some child that needs to be adopted? 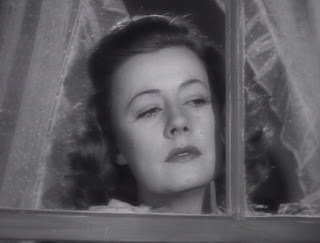 That might have resonated with Irene. Beulah Bondi as the head of the adoption agency is such a sweetheart here (I was initially worried she'd turn out to be an evil prison matron type), just so warm and compassionate to the couple. And Edgar Buchanan (whom I thought was Jack Oakie until about 5 minutes ago!) taking charge during the baby bath scene when mom and dad are so jittery, Applejack was such a likeable character. Dunne is--of course--terrific here. I've never heard anything but praise for her performance. Considering everything that happens to Julie, I think most actors and actresses would have really overdone it. It's clear she really analyzed the script and her character, and knew juuuust how far she should go. And I swear Susanne, I'm actually starting to like Cary, thanks to these movies with Irene! Hi, Rob! It's always great to hear from you and I am glad that you loved "Penny Serenade"! You make a good point for the Happy End (and if this was the reason it certainly would have resonated with Irene, especially because of her own adopted daughter...) Maybe "my" end would have been a little bit tough on moviegoers who expected another Dunne/Grant comedy? I love that movie and I almost feel like a traitor when I say that I agree about "Trina's" fake smile...one can almost hear the director saying, "SMILE" and click! there it is! Maybe the fake smile was to cover the fact that she was losing her teeth, or had the teeth of an older child than a 6 year old? I just watched this last night and did a google search for Trina age 6 and ended up here. I have to agree that the child chosen, whose smile was definitely featured in more than a couple scenes, wasn't as heartwarming for me, either. The baby Trina was adorable but I wondered about those crying scenes - what did they do to make those babies' eyes well up with tears or downright bellow? It was 1941... who knows what was considered 'allowed' in those days? 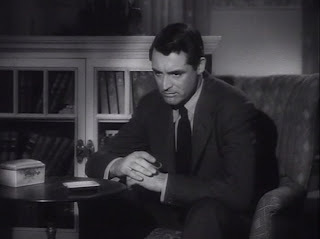 A charming movie and I cried my eyes out during Cary Grant's monologue in the judge's chambers. 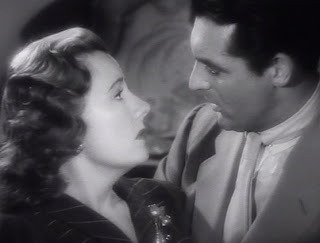 I was surprised by Irene Dunne's top billing given that she was co-starring with Cary Grant. I didn't realize Dunne was such a top draw. I was also amazed to discover that she was 43 when she shot Penny Serenade. Wow! She held her age well. Very good review. I agree about the ending which I thought was the shortcoming of the film but I know myself well enough to know I would have been unsettled by an open-ended ending. I finished the film in relative comfort because at least there was an ending, though all it would have taken to make it good would have been a little more imagination. I'd be curious to know the producer and director's explanation for ending it this way. I don't know what people are holding out for, but to me, little Trina's smile MADE that movie!! Even knowing that she died at the end, I watch "Penny Serenade" whenever possible, just to see Trina's bewitching smile!!! I agree with you. I love her and her smile. Also watch to see her. She is sweet, fragile and wanting to love and please. She is my favorite part. I was shocked to see anyone felt otherwise about her. I love the movie. And love Eva in it. Shocked someone didn't like her. The ending is a problem though. Eva Lee Kuney (1934–2015) I liked her in this. 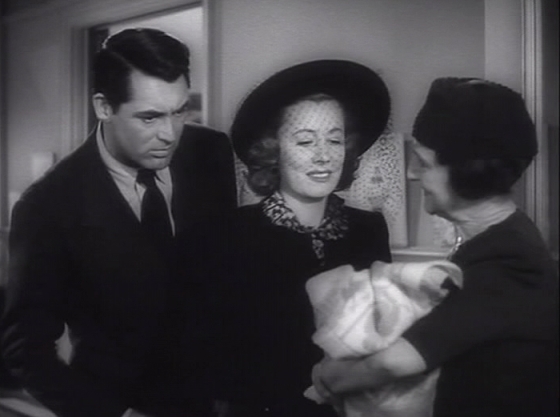 In your mention of dual casting of Irene with Cary Grant…they had done a movie in 1940 "My Favorite Wife". I'm a "vintage" movie buff (all the way back to the silents, like films by René Clair ("Le Million", "A Nous la Liberté")and the pioneer director Alice Guy & the tragic silent actually filmed in the wintry Paris streets - Ménilmontant….but also through Hitchcock's pre-Hollywood films & the 1930's and 1940's. Irene Dunne was an exquisite nuanced actress and Penny Serenade was the perfect vehicle for her subtlety. I'm old enough to barely remember the "listening booths" that allowed a customer to listen to a record before buying it. And after Cary Grant had spent so much time, ostensibly "previewing" his stack of records, when he's walking Irene back to her apt, and then gently asks if she can play one more record for him on her own apartment Victrola…Irene Dunne responds with a sigh and whimsical smile that was "Oscar worthy". On many accounts (the acting, script, direction, cinematography, and the natural pathos of the story) this film is a gem.